Hank Barnes recently was awarded the Eagle Scout rank. 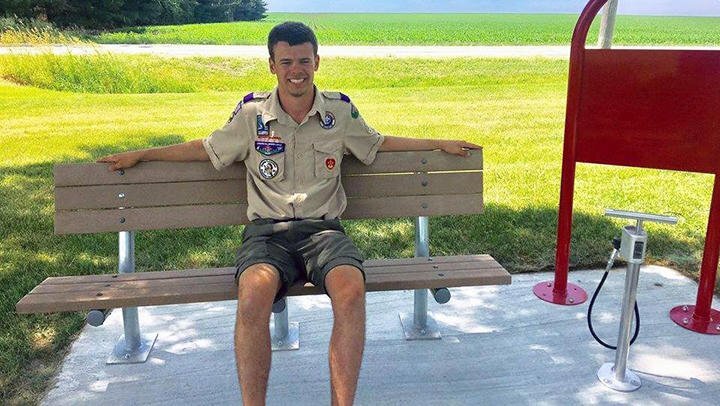 His Eagle project involved constructing a rest area at a bike trail along Taylor Street in DeKalb. Hank Barnes, son of Cohen and Amy Barnes, received the Eagle Scout Award as a member in Boy Scout Troop 33, sponsored by the First Lutheran Church in DeKalb. Eagle Scout is Scouting’s highest honor. Barnes joined Boy Scouting in fifth grade with Troop 33. Years of adventure marked his journey toward Eagle. Winters included cabin campouts, ski trips and the annual Klondike Derby. He enjoyed a challenging winter backpacking trip to Snow Base, located near Rice Lake, Wisconsin, that included winter survival training, snow hiking, flying a giant kite, climbing a tower, tobogganing, and finding hidden food using a GPS navigation device. Snowmobiles trips included 100-plus- and 200-plus-mile snowmobile adventures through the north woods of Wisconsin and Michigan, taking him as far north as Lake Superior. Lake of the Clouds in the Porcupine Mountains and Bond Falls were some of the special locations visited. Camp Lowden near Oregon, Illinois, a weeklong summer camp, was filled with fun and advancement opportunity. His highlight was swimming a full mile to earn the Mile Swim award. He enjoyed canoe trips on the historic Hennepin Canal in central Illinois and a 50-mile canoe trip at Boundary Waters Canoe Area in the deep wilderness along the U.S.-Canadian border. Another high adventure trip involved canoeing 61 miles across the Atchafalaya Swamp in Louisiana. Deep in Cajun country, the scouts camped using jungle hammocks with plenty of time for swimming, stand-up paddleboarding, a blow gun tournament, air boat ride, swamp fishing, plus snakes and alligators to keep things interesting. Barnes attended the 2013 National Scout Jamboree in West Virginia with more than 40,000 other Scouts and adult leaders from around the country, plus foreign guests. His community service has involved working on numerous local projects in the DeKalb area. He also worked on a large disaster relief project after a series of tornadoes in Oklahoma. Earning the Eagle Scout award includes planning, developing and giving leadership to an Eagle Service Project. Barnes’ project involved constructing a rest area at a bike trail along Taylor Street in DeKalb. It began with scouts hand-digging an excavation for its concrete foundation, then was completed with a bench and bicycle tire pump. Barnes holds membership in the Order of the Arrow, Scouting’s national honor society. He served in many leadership positions including senior patrol leader and junior assistant scoutmaster. The Eagle Scout Award requires 21 merit badges. He has earned 47. Barnes is a senior at DeKalb High School.